Well, it was a pretty awkward moment for me when I released that the Little Fat Duck was actually a moving restaurant, on a lorry of course. Fully equipped with fiery stoves and other utensils. I first heard of the Little Fat Duck on Facebook. Saw the ad/recommended list somewhere and I decided to click on it. At the time, I wasn't paying attention to how or what it looked like but more towards the user's comments. Most of them were positive so I thought I'd give it a try. So here I am, approaching the Little Fat Duck at SS15. Little Fat Duck, Established 2014. This was taken at approximately 10pm++ at night. The was a pretty huge crowd. All the tables were taken/shared and some even had to sit on the road divider. I initially thought I had to dine in my car. With a little "Kiasu-ness" in me, I decided to wait for a table, hoping one would choke on their food and leave for the nearest hospital (SDMC/Sunway Medical). Unfortunately, that did not happen but a couple was kind enough to share their table with us. Since they were strangers, I tried not to take photo with my flash, which resulted horribly. Thankfully, they left after eating and I was able to whip out my 'Eye of Sauron'. Order No.28 it was. The waiting time wasn't all that bad, I waited somewhat between 10-15 minutes till my order arrives. For such an efficient restaurant, they sure have a pretty fancy company logo. Which was beautiful, I like the whole 'fine-dining' feel it gives you. This was my favourite among all that I've tried. Generous amount of creamy pesto sauce with well cooked pasta. Consistent and flavouful. Just the right amount of seasoning and a few chunks of fish. A great supper meal. I somehow thought this had a larger serving as compared to the creamy pesto. Nevertheless, the bolognese sauce was pretty good. Although a little watery, but still flavourful. The mass amount of ingredients used can be seen in the photo. This was, a little weird. Possibly an overkill for me. It was flushed with spices and seasoning, overpowering everything. The only thing that I could taste was heat(spiciness+a smokey sensation). Still, better than having no taste whatsoever. This was the least favourite of mine because of 2 reasons. No.1, the sauce was very watery and No.2, it was under-seasoned. Tasted really bland. 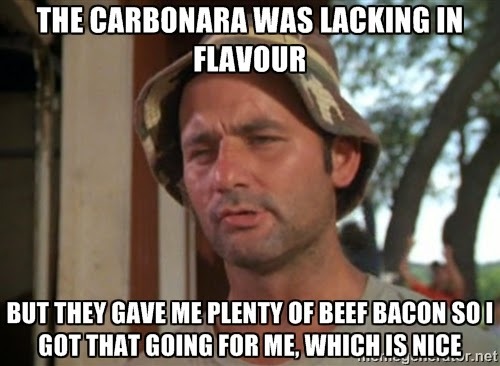 But at least they gave us quite a number of beef bacon, so we got going for us, which is nice. A very simple omelette with pieces of beef salami inside. Nothing too complicated, easy, simple, straight-forwarded, great flavours. Overall, I've ordered everything on the Pasta menu and a single omelette. As you can see, all of it is priced at RM5 per serving. Which is really cheap compared to what you get in most restaurant. I believe the cheapest spaghetti I've had was priced at RM7 but it tasted horrible. Even the portion was ridicule. For RM5 per box, the serving wasn't all that much but it was certainly enough for a light dinner or supper-snack. Furthermore, the taste of the pasta was pretty good despite the price. In front of Public Bank SS15.